For the 35th anniversary of iconic sitcom The Good Life, and in homage to Tom and Barbara Good, Giles Coren and Sue Perkins are trying out self-sufficiency in the suburbs. But is it really possible to live out of the rat race and off grid in modern Britain? Through Giles and Sue's experiments in dying and making clothes, rearing chickens, goats and pigs, growing veg in the garden, selling their produce to the public and making their own electricity, this book shows you how to be greener, reduce your carbon footprint and, in the spirit of Tom and Barbara Good, how to live more self-sufficiently too. 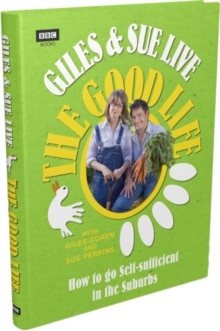 Packed with practical information, and helpful hints and tips, Giles and Sue Live The Good Life is an inspirational new handbook for sustainable living.